There are lots of things I could write about Textiles, and lots of other subjects I could have chosen starting with T, but, I have just got in a new order of Artist Designed Fabrics, and so its time to do a bit of Shop Talk. 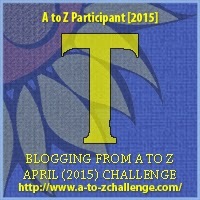 My normal routine has been totally messed up by my choice to do this daily A-Z Challenge – smile – so I think its about time to do a bit of selling! These are the lovely and unusual Art Gallery Fabrics I have chosen to add to the collection – you can find them under fabrics in my etsy shop, and starting here on ebay. All the fabrics above are pure cotton, 45″ wide, that can be used in all kinds of ways, from dressmaking to quilting. 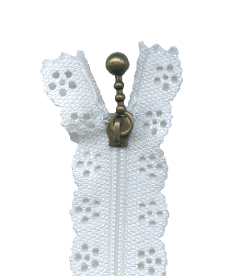 I have also ordered a few of these lovely lace zips, which should be just right for a wedding dress, or special summer outfit – I have only 5 of these to try – 35 cm long, but if there is interest, I can order more, and in all kinds of different colours! And a quick reminder of the other fabrics I currently have in stock – which are in my etsy shop, and on the 85solway ebay account, at the moment! This is a long but fascinating article about the regeneration of a community in Peru, by going back to the traditional methods of vat dyeing with natural plants, and spinning and weaving their own alpaca wool. The rainbow was born in the town of Chinchero, Peru, according to Incan mythology. Today, when the weavers of the area gather to dye wool in vats of boiling water, myth seems to become reality. The women wear bright red jackets as they tend to the vats, samples of already dyed wool are laid out — from blue to saffron to purple — and a weaver stirs a pot of deep moss-green wool with a long wooden pole. Peru hosted the 20th annual Conference of the Parties (COP) to the United Nations Framework Convention on Climate Change late last year, and was the backdrop for far-reaching negotiations among more than 190 countries about the impact of climate change. And Peru is also home to the small-scale but powerful work being done by artisans like weavers in Chinchero, especially in terms of how their work supports and preserves the biodiversity of the region. Today a dyeing workshop run by the Center for Traditional Textiles of Cusco (CTTC), a group that supports and promotes traditional weaving and spinning, has drawn more than 100 people to the area to master the centuries-old traditional technique of making naturally dyed wool. 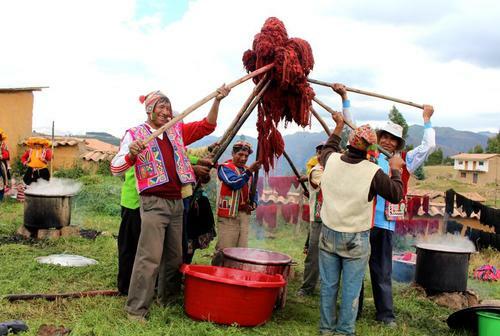 Participants tend the vats of boiling water and work with the dyestuff, which includes chillca flowers from the nearby mountains, used to produce the color green; shapy, a vine that makes the color pink, collected from the jungle beyond the neighboring community of Accha Alta; and the insect cochineal, which feeds on cactus and is ground to make the color red. Until recently, many of the ancient weaving customs of Chinchero, which are rooted in the stunning biodiversity of the area — from natural dyeing to harvesting alpaca wool — had all but disappeared for decades, during which chemical dyes and machine weaving pushed out the old techniques. Now, however, natural dyeing and traditional weaving methods can take some of the credit for having brought an economic, environmental, and social renewal to the region. The textiles produced in Chinchero are sold globally and are on display in museums around the world, and that’s partly thanks to one woman, Nilda Callañaupa. Forty years ago, Chinchero was home to a young girl, whose job it was to tend sheep as they grazed. As the many hours of the day passed on the hillside, she spun wool as she watched her animal charges, as girls her age were expected to do, producing usable skeins of wool. The wool was used to make the textiles that were an important part of the community — as blankets, clothing, in farming, and in sacred rituals. And as the girl spun, she became entranced with the act — so much so that she found herself dreaming of spinning as she slept each night. 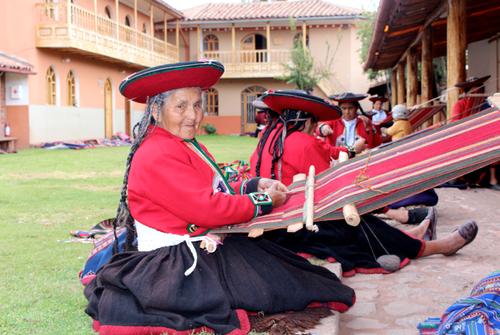 As that girl spinning on the mountainside grew older and her interest in weaving became a passion, she noticed that the traditional methods of dyeing wool and weaving were disappearing from Chinchero. The techniques, handed down orally over the years, were not recorded in writing, and the younger generations showed greater interest in leaving Chinchero for the cities of Peru than in learning from their elders. Textiles were still important to the community, but cheap chemical dyes, acrylic yarn, and machines were being used more widely by the weavers. “The textile process was poorly managed,” says Callañaupa. “The younger generation was not working with the same attention to quality as the elders.” The growing tourist market had created a demand for simple, quickly produced designs and products of lesser quality: belts, bags, friendship bracelets from exotic, “foreign” lands. Commercially produced synthetic dyes were bright, cheap, and easy to use (natural dyeing is a much longer, more expensive process), and the weavers in Chincero were rapidly abandoning the traditional methods. Beyond the degradation of quality that such developments implied, Callañaupa saw the loss of the connection between nature and culture looming. The ecosystem management systems that went along with the old methods (sustainable use of plants, animals, water, and land), developed over thousands of years, were becoming lost — and the ecosystem was suffering. It’s a phenomenon that occurs far beyond Chinchero, in fact. As Greenpeace reported, the textile industry’s impact on the environment in terms of water and land use, energy efficiency, waste production, chemical use, and greenhouse-gas emissions is alarming. Groups like SlowColor are trying to tackle this problem, as their website explains. “SlowColor rejuvenates centuries-old fabric dyeing techniques and handlooming traditions, protects the environment and creates fabrics that are healthy for life. SlowColor connects artisan to audience, tradition to global market.” And in the highlands of Peru, these are precisely the methods advocated by Callañaupa and the CTTC. As a teenager, Callañaupa became close friends with an older woman of the community, who taught her how to weave in the traditional ways. Callañaupa’s love of learning led her to become the first in her community to go to university, then on to study in the United States at Berkeley — and she took her spindle with her. Callañaupa easily could have made a life for herself away from Chinchero. But after earning graduate degrees, she returned to the lush valley of her youth, with a commitment to researching and revitalizing the ancient weaving and dyeing techniques of her elders. It was a calling that led Callañaupa to establish the CTTC in 1996. In addition to holding periodic dyeing workshops for weavers in the region, the Center runs programs for youth and elders. “Not only do I hope that young people will continue their traditions but I would like to see Inca children today experiencing the joy, sense of identity and accomplishment that spinning and weaving can bring to their lives,” says Callañaupa. In a relatively short span of time, this community, in which it seemed that the ancient ways would be lost forever, has reclaimed its roots — and the change has gone beyond the weaving. When you walk through Chinchero, perhaps through the Sunday market where many textiles are sold, many of the townspeople are dressed in traditional garb; as recently as 10 years ago, this wasn’t the case. It was Callañaupa and others in her community who encouraged the community to begin dressing as their ancestors had, as a way of strengthening their connection to the old ways — to strong criticism at first. It has been, in fact, by “going backwards” that Chinchero has not only survived but thrived. The old weaving techniques, once scorned, now have great value. More young people are staying in Chincero and making a living from weaving, as opposed to going to the cities and facing an uncertain and potentially dangerous future. Women are now economically empowered, which has a net positive effect on their families and the community as a whole. Water use is an important part of the picture, too. Any dyeing process — whether it’s with synthetic or natural dyes — uses large amounts of water, so to be environmentally responsible, there has to be some awareness of where the water comes from. The region of the CTTC is part of an innovative watershed services project that is protecting Lake Piuray, a major source of water for Cusco and Chinchero. This project is backed by the national water regulator, SUNASS, and executed with the funds of water users, via the Cusco water company (SEDACUSCO). Such a collaboration is unique, and has generated enthusiasm among the various actors and the desire to replicate these kinds of win-win projects throughout Peru. And after the dyeing process, there is the matter of the waste water. As SlowColor’s Tricia O’Keefe says about chemical dye use, “What happens to the after you’re done dyeing? Where are those chemicals going? That is a huge issue … the thing about the natural dyes is that you could completely recycle that water.” In using natural dyes over synthetic, Callañaupa and her weavers are ensuring that toxic chemicals are not released into the environment via the run-off water. The use of natural dyes over chemical dyes, the preservation and promotion of biodiversity in the indigenous plant and animal species that are vital to the weaving, in the bigger picture of recovering centuries-old environmentally friendly methods of weaving, has made the Center a model for climate change mitigation. As the Alliance for Artisan Enterprise‘s Peggy Clark describes the reasoning behind her group’s support of Callañaupa, “One of the things that people think is that environment is separate from economy, so there’s not enough support and investment to move the needle and make a difference. The only way to do that is to broaden the tent. Callañaupa’s work means that we can produce goods that have global value in a way that doesn’t ruin the soil or deplete the water table or poison the air. We can engage the youth in our communities in healthy, life-affirming activity, and we can reward their efforts with a sustainable livelihood. And while the leaders convene at COP, Callañaupa and her weavers will be creating art — each piece a “story” — that preserves and promotes the biodiversity that sustains us all, one thread at a time. This report was filed by Ann Clark Espuelas.